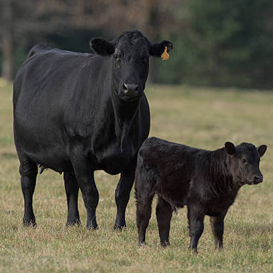 The Benchmark Angus females are bred to be broody and feminine. They must milk adequately and be fertile such that a 365 day calving interval is maintained. As well, they must walk on good feet and legs to enable them to survive in our large 800 acre pastures. They need to be trouble free cows as they are a long distance from the corral all summer and fall. We also look for those cows who mother their calves from birth to weaning - those are the cows that bring home the heaviest calves in the fall. Constant monitoring of birth weights and calving ease tells us that the cow probably has as much or more to do with birth weight and calving ease as the bull you are using. These cows are our factory and we are most mindful of how they produce. We are striving for a moderate sized cow that weans at least 50% of her own body weight and calves within a 365 day interval year after year. Her bull calves should be better than their sires are and her heifer calves should be better than she is. Temperament is of prime importance as we don't need rodeos around our place when we are working with the cows. Red or Black - they have it all!